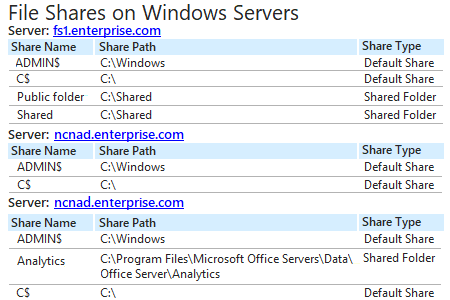 Write-Error "Failed to connect retrieve Shares from $Computer"
Run Netwrix Auditor → Navigate to Reports → Open “Windows Server” → Go to “Windows Server - State-in-Time” → Select “File Shares on Windows Servers” → Click “View”. To save the report, click the “Export” button and choose PDF, Word or Excel format. To receive the report regularly by email, click the “Subscribe” button and choose the schedule you prefer. 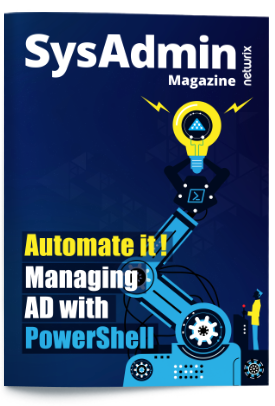 By default, the Microsoft Windows operating system creates a number of hidden shared folders, called “admin shares,” that are accessible only to users with administrative privileges. In addition, users can create non-default shared folders using Windows Explorer in order to share information across the network. 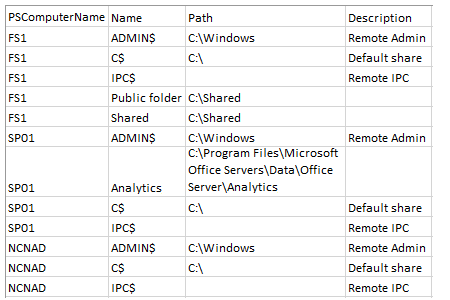 Since both types of shared folders can contain sensitive information, to maintain data security and minimize the risk of data breaches, you need to review a list of shared folders across your Windows servers on a regular basis, so you can exercise proper security control over your files and folders. Netwrix Auditor for Windows Server enables you to check shared folders across all of your servers and quickly spot any suspicious shares that deviate from your known good baseline, in accordance with computer management best practices. The list of file shares includes the name and type of every file share on a specific Windows server, so you can reduce your attack surface area with regular cleanup.